Since my family planned on eating out this Easter, I decided to do something a little extra special for dessert. My inspiration for this cake came from the winner of the ultimate recipe challange on the food network. 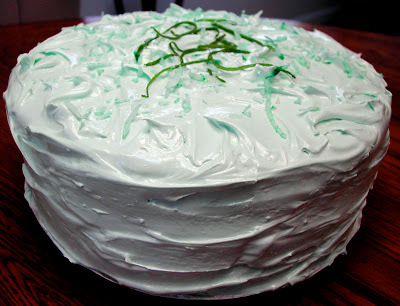 The name of the original recipe is Put the Lime in the Coconut Cake. The cake sounds delicious as is, but my brother in law is lactose intolerant, so I changed the recipe to make it lactose free. The cake turned out delicious. It was very dense and super, super moist, which I guess was due in part to the lime glaze. I decorated it in two ways to show how versatile this cake can be...Fun and colorful or soft and sophisticated. You decide. The only bonehead thing I did while making this recipe is that I colored an entire bag of coconut with green food coloring, not realizing that I only needed about 1/2 a bag. So now I'm trying to figure out what to make with the rest of the green grassy looking coconut. Got any ideas? Preheat oven to 350 degrees F and grease 2 (9-inch) cake pans. Cut 2 round parchment disks to fit 9 inch cake pans. Place the disks on the bottom of the greased pans. Grease disks and flour pans. Shake out excess. In an electric mixer or using a hand beater, cream butter, coconut oil and sugar until light and fluffy. Stop the mixer and scrape down the sides. Add eggs 1 at a time. With the mixer on low speed, add the flour mixture alternately with the coconut milk to the butter sugar mixture in 3 batches, beginning and ending with the flour mixture. Do not over mix. Divide the batter evenly between the pans and bang the pans on the counter top several times to remove any air and to distribute the batter evenly in the pan. Bake for 25 to 28 minutes rotating pans halfway through. Allow to cool 10 minutes hen remove and transfer to a cooling rack; cool completely. For Glaze: In a medium bowl combine sugar, lime zest and juice, coconut milk and shredded coconut. With a bamboo skewer, poke holes in cake and spread glaze on tops both cakes. Cover with plastic wrap, chill until ready to frost cake, preferably overnight. For Frosting: Place the egg whites, sugar, water, cream of tartar and salt into a medium size-mixing bowl. Set bowl over a pot of simmering water; do not allow bottom of bowl to touch water. Begin beating with a hand mixer set to low speed. Beat for 1 minute; increase the speed to medium and continue to beat until frosting is stiff and holds soft peaks (about 10 minutes). Remove bowl from the heat and add coconut and vanilla extracts and the green food coloring, if desired; beat an additional minute. Set aside to cool. Add the food coloring to the coconut and mix well until evenly colored. Frost cake. Coat top and sides with green shredded coconut. 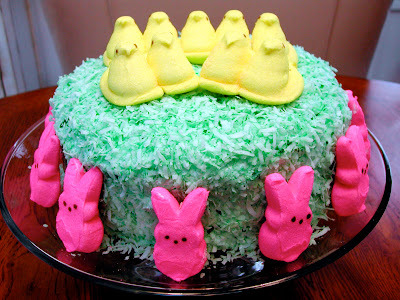 Decorate with peeps if desired. So cute! The cake sounds wonderful. Whoooo! LOOK at that cake-that's pretty great looking. Looks like a party. I don't know what you make with green coconut. You might have to throw it away. Maybe you make some sort of "Spring" cookie? P.S. I watched that Ultimate Recipe Showdown. A basic chocolate cake won the whole thing! Haha, I love your designs, especially the one with the Peeps! My best friend is obsessed with those things!